Man, that is awesome… That would be so neat. Carbonated ketchup… I bet it would taste so awful yet so funderful at the same time. I wonder if it would work. 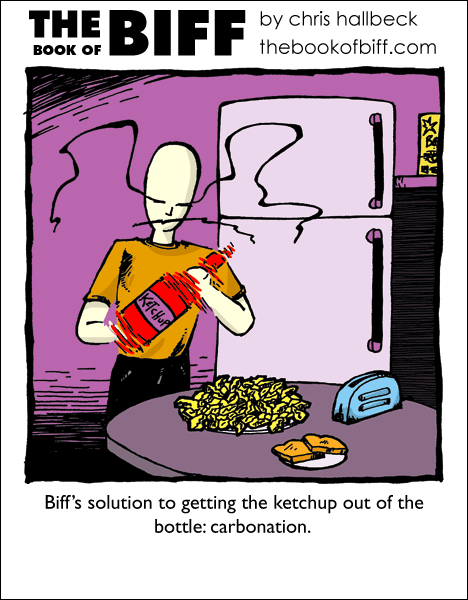 I know you can buy those kits to carbonate fruit juice… ketchup might be too thick. This might be a good idear. This one’s a big f’n mess in the making, no? Biff really likes toast dosen’t he? Toast and a crapload of fries… Mmmm Mmm, good. Isn’t it strange that ketchup will stain red on any color but black (on which it leaves a white mark)? I could live with the massive mess, as long as my ketchup still tasted like Ketchup. Eeew, ketchup… Save your self and throw it away, Biff. holy crud! they need to sell that, thats such a good idea! ..just thinking of all the times ive been in a restaurant with those infernal bottles of ketchup that are near completely full and nothing comes out! I’m glad I wasn’t drinking anything when I read this one. It’d be fun to try atleast once. It’s actually very easy to make ketchup explode from the nozzle of the bottle. Baking powder (One of Ryan Dunn’s house pranks). chief of police: Alright, what do we got. cop: Well, there’s a huge plate of fries, some toast, the kitchen is covered with ketchup, blood, and glass shards, and the victim, still holding part of the bottle, is almost nonexistant. I’m going to say he was smashing himself with the bottle, while running around the kitchen in some sort of frenchfry and toast ritual. Chief: perhaps, but leave the rampaging 3 year old mob excuse open. I’m not cleaning up that mess! why isn’t this available on a shirt? I think it would be an awesome idea but not necessary. My family has a secret technique for getting anything to the top of a bottle. It involves holding the bottom of the bottle and hitting it down…. Whoops, guess it isn’t a secret anymore!! Love the comic!! The only thing that could possibly make this better is Pop Rocks. just don’t let it come out your nose. Ooh, that makes me think of an awesome Human Art sketch from Japan. You’ll have to watch the ending to understand the connection. S’pretty short/awesome, so don’t worry about it. OMG That was kewl, WonofTew! I find it amazing that those two pieces of toast came from the single slot toaster. altough knowing biff he probably has two toasters and that toast was bread from yesterday when he decided he didn’t wan’t it. Ketchup ready! FIRE IN THE HOLE! It would look as if the Texas Chainsaw Massacre happened in the kitchen but DAMN would it be a tasty massacre! Biff should suggest this to the F1 guys. My father’s trick is to hold your left hand steady over the meal and strike the gap between thumb and forefinger with the base of the neck of the bottle (where it joins the widest part of the bottle). If you strike the base, much of the force is lost, however if you move the bottle and the sauce, and then stop the bottle, the sauce will want to keep moving. @Kaos: Great tip from a waiter I met once: If you find yourself fighting with a glass ketchup bottle, try hitting the “57” on the neck. It really works! Also, I have a friend who I think pressurizes his condiments. Every time I eat dinner at his house I get squirted at by a bottle of something. Last time I opened a bottle of dressing and it squirted about a foot into the air.